Three-day weekends are the best! That extra day makes it feel like a real vacation. What are your family traditions? Do you picnic or go to the beach? Is there a neighborhood softball game, or do you enjoy pool parties. Memorial Day weather in the San Francisco area is usually perfect and it’s a great time to use our grill. While gas grills are convenient and quick, I prefer charcoal fires for the flavor. But don’t use lighter fluid. It makes your food taste like chemicals and it is bad for the environment. If you haven’t already, buy yourself a chimney starter. It is a metal cylinder that you stuff with paper and coals. Light the paper and the concentrated heat is drawn upward, igniting the coals quickly. Barbecue means different things depending on what part of the United States you are from. In the Carolinas, they host pig pickin’ parties and the pork is often served with a vinegar-based mop sauce. In Memphis they prefer ribs made with a dry rub. In Kansas City, the specialty is pork ribs with a tomato-based sauce. In Texas, beef rules and brisket is king. And in California, anything goes and the mild weather invites us to use our grills nearly all year long. While I grew up eating traditional tomato-based sauces, sometimes I like to change it up. This year I am making a spicy Hoisin sauce to baste our steaks with and an Asian slaw with a Chili-Soy Vinaigrette to go alongside. There will probably be old-fashioned potato salad and maybe a cherry pie, a family favorite. The blending of traditional flavors and new cuisines mirrors the multi-cultural environment of the West coast. No matter how you decide to celebrate your holiday, I hope you have a wonderful time with your family and friends. And take a few minutes to say thank you to all those who serve in the Military and help protect our freedoms. When you get cilantro at the store it can be full of dirt particles. Rinse well and pat dry. To easily chop it, hold the bunch in the air by the stems and shave off a portion of the leaves, slicing downward with a sharp knife. This yields more leaves and fewer stems. Shave off just what you need and store the remaining cilantro on the counter with the stems in a jar of water. Preheat an electric grill, or light a medium-sized charcoal fire in the barbecue. To make sauce, in a medium saucepan, heat 1/4 cup oil. Add the shallots, garlic, ginger, pepper flakes, and cilantro. Cook over medium heat about 7 minutes. Stir in the hoisin, soy sauce, and chicken stock. Raise the heat to medium-high and boil until sauce is thickened, about 5 minutes. Add the honey and stir until melted. Remove from heat and stir in butter. Whisk until incorporated. Keep warm. Rub the steaks with some oil and sprinkle with salt and pepper. Skewer the onion slices, brush with oil, and sprinkle with salt and pepper. Place the steaks on the hot part of the grill and the onions around the outside. Cook steaks about 4 minutes per side for medium rare. 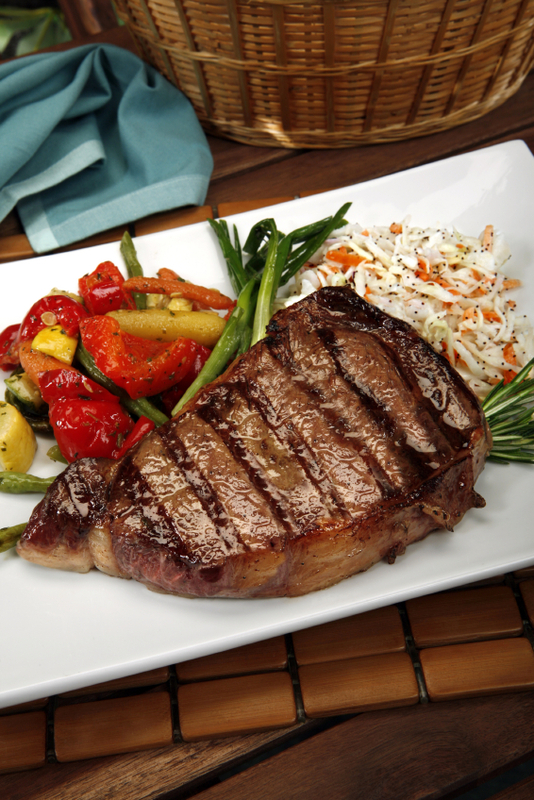 Remove from grill and let rest on a cutting board for at least 5 minutes. 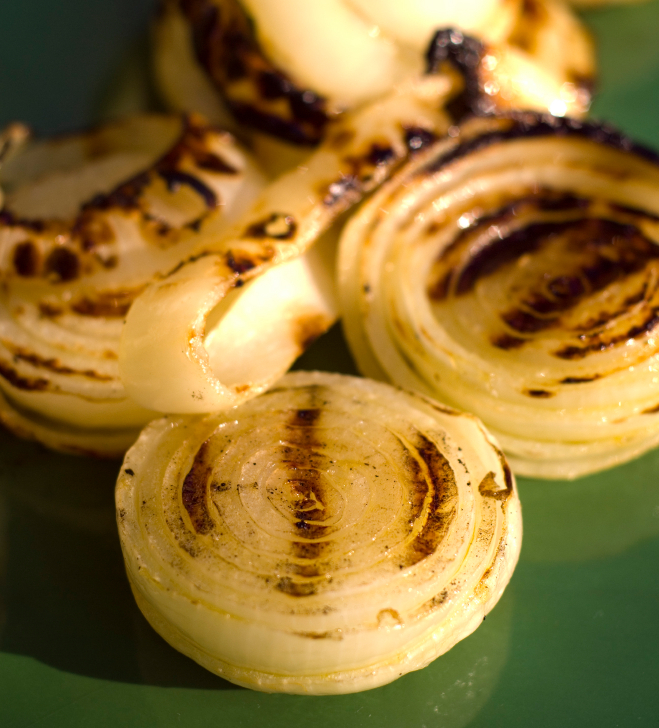 While the steaks are resting, move the onions to the hot part of the grill and cook until they have grill marks and are slightly softened, about 3 minutes per side. Slice the steak and serve with grilled onions and Asian Steak Sauce and Slaw. Quarter and core cabbage. Stack cabbage quarters and press lightly as you thinly slice them diagonally. 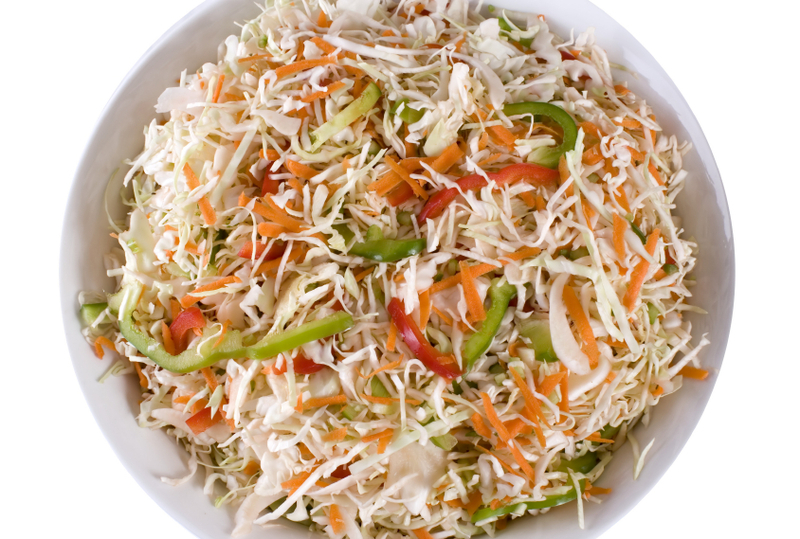 Turn the pile of shredded cabbage and cut crosswise into thirds. Toss cabbage, bell peppers, carrots, bok choy, and jalapeño with the sugar and salt in a colander set over a medium bowl. Let stand until the cabbage wilts and liquids have drained, 1 to 3 hours. Discard draining liquid. Combine wilted cabbage with remaining ingredients in a large bowl. Pour in Chili-Soy vinaigrette and toss thoroughly. Serve chilled or at room temperature. By © 2005 Jane Bonacci, The Heritage Cook. All rights reserved. Combine all ingredients in a jar and shake until emulsified. Will hold in the refrigerator up to 2 weeks. « Ingredients for Chocolate Monday!